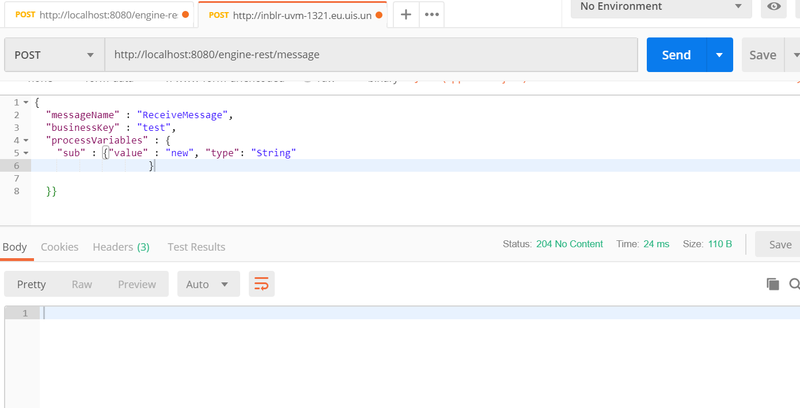 I am trying to use REST API to correlate a message. I came across localCorrelationKeys and correlationKeys as a parameters. The description is not so clear. Do these variables correlate to corresponding variables of the process instance receiving the message? What happens if the corresponding variables are not present in the process instance? Is there any error thrown for this scenario? The rest api doc for correlationkey says it correlates to “process variables” and localkey says it correlates with a “local variables”. Instead, if i send the same variable as “processVariables” , it is overriding the already existing process variable. So , why is this behavior? if you are using processVariables as a property then you are injecting the “sub” variable into the correlated process. processVariables is not for correlation, it’s for injecting variables. 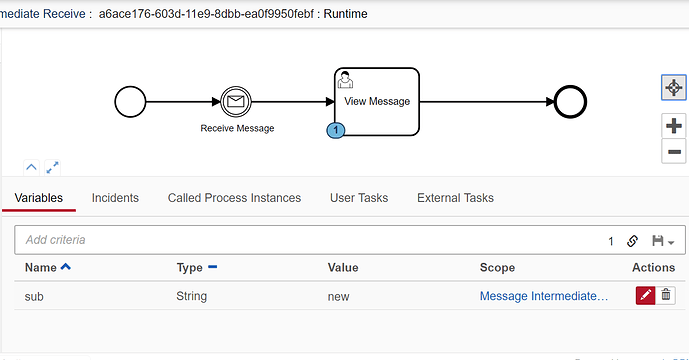 Can you show a screenshot of Cockpit showing a process that is waiting for the “ReceiveMessage” with the “sub” variable as a process variable? 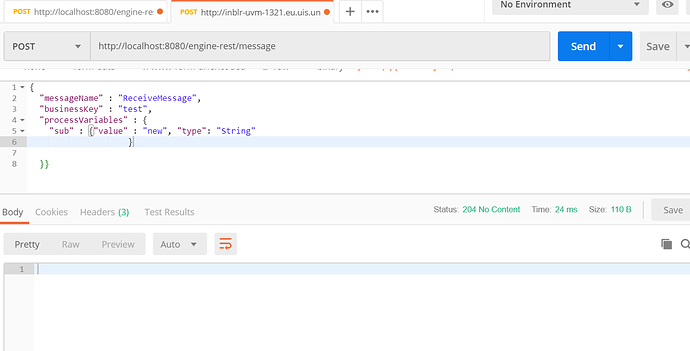 1.process instance waiting to receive message “ReceiveMessage” with a process variable “sub” of type string, value “sindhu”. 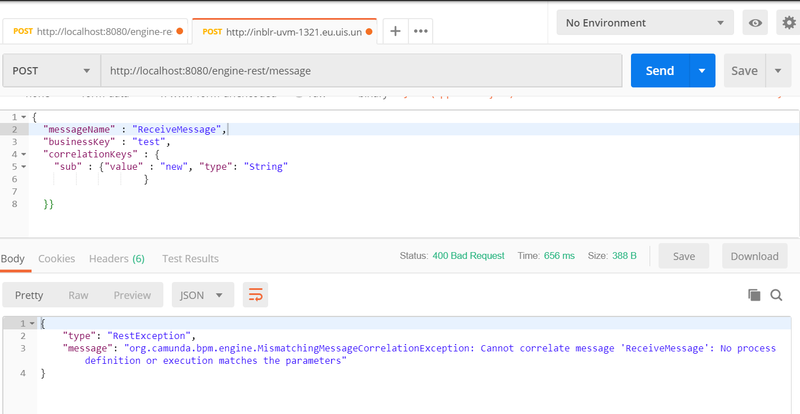 Sending request using REST API with “correlationKeys” parameter and variable as sub and with new value “new”. you likely have a typo somewhere. I have tested “correlationKeys” parameter by giving same value of process variable . I was previously trying with new value. It was not working. Now , its working when am using value which is available in process instance. Its working. So , basically the behavior here is, if we use “correlationKeys” parameter, the variable name and value are matched. if it is matching, it correlates message to that particular catching event. Where as, if we use parameter “ProcessVariables” , if variable is not existing as process variable, it is injected. If existing, it is overriden. I was trying to send new variables using correlation keys parameter.So , looks like correlationKeys parameter is to match with the catching message event, where as “processvariables” parameter modifies the data.